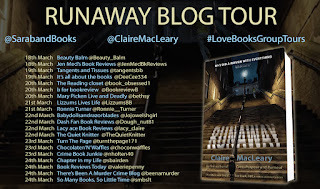 Today is my stop on the blog tour for Runaway by Claire MacLeary, I am closing the tour, if you missed the previous stops please check them out as we all offer different content, this is a #LoveBooksGroup tour. When Aberdeen housewife Debbie Milne abruptly vanishes without trace, leaving behind her two young children, husband Scott is too distraught to sit out the police's 72-hour window and await developments. He turns to local detective agency Harcus & Laird. Put off by previous "domestic" cases, Maggie Laird isn't keen, but is cajoled by partner Wilma Harcus into a covert operation. Together they comb through meagre scraps of information, eventually trawling the city's women's refuges and homeless squats, in spite of the deadly danger. Then a woman's body is discovered in a Dundee builder's skip. With the clock ticking and the police struggling to make identification, the race is on. 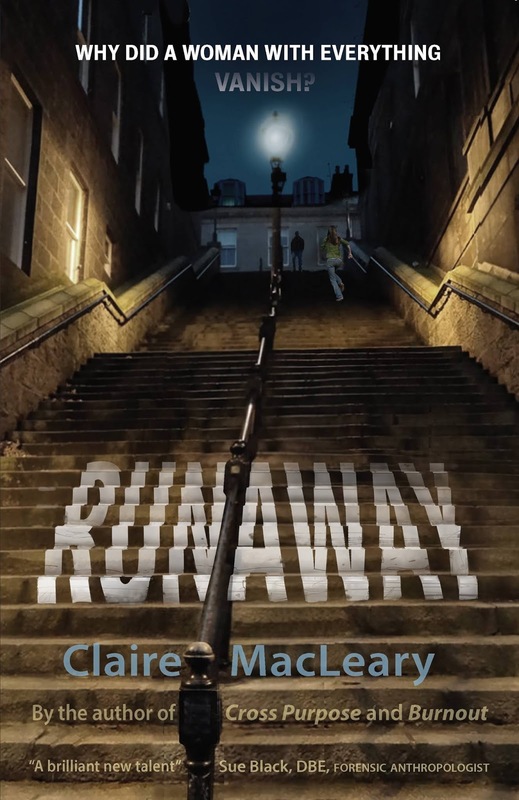 Claire MacLeary fashions a surprising, gritty, fast-paced tale with the warmth and wisdom of ‘women of a certain age'. For my stop I have the back story from the author, check it out and enjoy. When first I set out to write a crime novel, researching what was out there seemed the obvious place to start. Having read a wide range of British, Scandinavian, French and Italian thrillers, it appeared the protagonists fell into two main categories: hardened detectives and highly skilled forensic scientists. 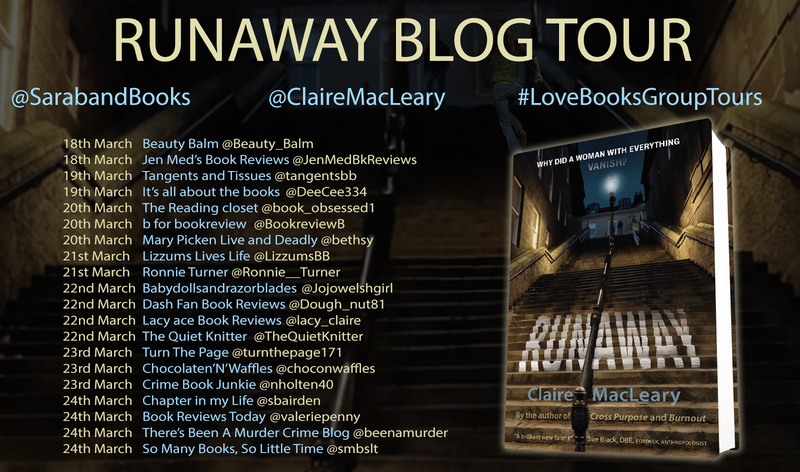 Tartan Noir, in the main, was populated by policemen with drink and/or relationship problems. Hugely successful though many of these books are, I determined my best hope of being published was to write something completely different. What if I were to write a crime novel in which nobody was qualified in anything? The idea seeded in my head. As it began to grow, I combed my memory for a lead character. A woman, for sure, since women are underrepresented as protagonists. Where does this woman live, I asked myself? Not in the Central Belt, where many Scottish crime novels are set. Not in my (then) home town of St Andrews, which maintains a limited police presence. I settled for Aberdeen, where I'd lived for some years and which offers a wide range of sources on which to draw: a rich history, an ancient university, the North Sea, fishing, farming, oil. What does she do for a living, this non-professional woman? Most likely work in a low-paid job and/or be stuck at home with her kids. So how does she become involved in crime? Since she has little knowledge of police procedure, far less forensics, she'll have to – somehow – become a private investigator. On her own? Unlikely? Perhaps she has a friend. Or a neighbour? And so came into being Maggie and Wilma, two ordinary women 'of a certain age', living in modest semi-detached bungalows in an Aberdeen suburb. They're women every reader can identify with. Neither young nor especially pretty – Wilma's weight yo-yos, Maggie has a wall eye that knocks her confidence – they juggle part-time jobs with doing the household shop and stirring the mince. Menial tasks. But like many other women in the same situation, they have a deep well of inner resource they can draw on when needed: life skills, resilience, common sense. Thus armed, my unlikely PIs, Maggie and Wilma, set out to challenge authority and combat injustice. Two ordinary women doing extraordinary things.